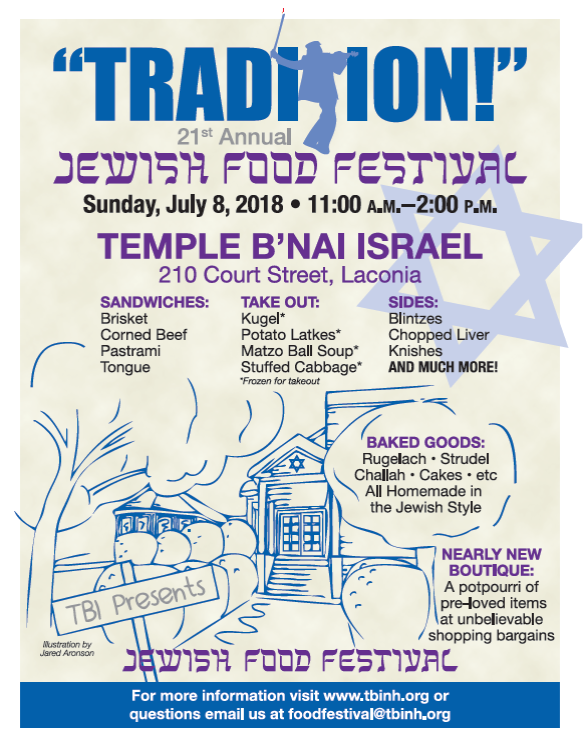 Once again, the event to attend this summer is the 21st Annual Jewish Food Festival at Temple B’nai Israel in Laconia on Sunday, July 8th, from 11:00-2:00. People will be coming together from all over New Hampshire and beyond to enjoy the memories of the tastes and smells from the kitchens of Jewish mothers and Bubbes (grandmothers) through the ages…from traditional Jewish cooking to delicatessen delights to amazing desserts and more! In addition to the tasty array of homemade products, the Food Festival features corned beef, pastrami and tongue “imported” from Evan’s Deli in Marblehead, Massachusetts. Evan hand cooks his meats in the deli kitchen and food critics and patrons alike declare, “This meat is out of this world.” Treat yourself and your family to a fresh Evan’s Deli meat sandwich or any of the other homemade Jewish delicacies including deli meats or TBI’s homemade beef brisket with pickle and coleslaw on rye or roll, knishes (meat & potato), blintzes, chopped herring, and chopped chicken liver. Available for takeout, all frozen and ready to heat at home – while supplies last – deli meats and brisket, matzo ball soup, potato latkes, noodle kugel, stuffed cabbage, rugelach and strudel. And don’t forget the half sour pickles as well as the fabulous assortment of homemade desserts. The best day of the year. This is an epic annual event in Laconia; a valuable cultural event for our community. Absolutely incredible. Out first time here, but not our last! Wonderful people! The highlight of our weekend. We were warmly welcomed, greeted and cared for. We’ll be back next year with our friends! However, this Festival is about more than food. You will find many assorted treasures at the Nearly New Boutique on the front lawn as well as new Judaica items inside. Attendees meet old and new friends from the community at large, both Jewish Food connoisseurs and rookies.